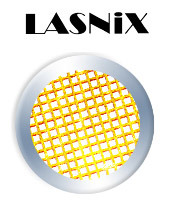 LASNIX polarizers are precision thin film elements to perfectly polarize a CO2 laser beam. The other beam parameters such as alignment stay unaffected. The polarizers are mounted in lightweight oriented frames for simple installation and ease of use. The design principle is based on proprietary free-standing metal grid technology introduced by LASNIX in 1984. 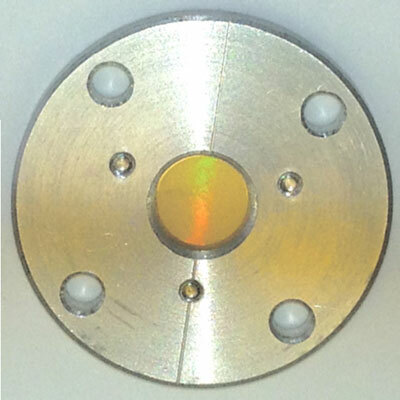 Extending the traditional Hertz's wire grid polarizer we have tailored the wire shape to obtain a high transmittance in the CO2 laser region. Furthermore the precise fabrication of the grid spacing routinely guarantees a very high polarization contrast exceeding 10 000 : 1. Remarkably high power handling up to 30 W c.w. is achieved. Since the grids are freely suspended, i.e. have no substrate, they can not offset the beam in contrast to common substrate-bound polarizers. The polarized transmitted beam passes undeviated even at the upper power limit. The mode structure and other beam properties, including the divergence and M2 parameters are fully preserved.